It is not hard to lose track of the various Audeze headphones as they have similar names and variations on a theme. One of their latest models is the LCD2 Closed-Back planar over-ears and as of the time of writing, five units of these are in-stock and shipping for their starting price of $899 by World Wide Stereo (WWS), through Amazon. Prime members get them with Prime-like delivery speed even though they ship directly from WWS. Welcome to the Audeze B-Stock party at Adorama! For a limited time, they are offering a number of Audeze headphones in B-stock condition at sale prices! We start this party with the refurbished Audeze EL-8 Open Back Planar Magnetic (with the standard cable) going for $229 with free shipping and a 1-year Audeze warranty! This is the only one of this round of offers that is a refurbished B-stock. The B-Stock action continues at Adorama.com with the Audeze LCD-2 Shedua Wood Edition planar-magnetic open-back over-ear headphones offered for a limited time for $529 with free shipping and with full Audeze warranty. This model comes with the Audeze “Professional Travel Case”. More Audeze-Adorama action of the B-Stock kind, it is the closed-back AUDEZE SINE On-Ears offered for $180 with free shipping in B-stock with full Audeze warranty at Adorama! All your Audeze dreams have come true IF you were looking to get the Audeze EL-8 closed-back over-ear planar magnetics for $250 with free shipping in B-Stock condition with an Audeze warranty. Not an April Fool’s Day! That’s the sale running at the moment at Adorama.com, an authorized Audeze dealer! This is the black/silver color scheme, no wood. The open-back over-ear planar-magnetic Audeze EL-8 headphones are currently offered in open-box “Used – Like New” condition with full warranty per the individual listing of Gramophone (Maryland authorized dealer) through Amazon Warehouse Deals for $399 with free shipping. These ship directly from Gramophone and are not Prime eligible. Another seller has them for the same price (World Wide Stereo) but their listing does not promise a fully warranty. The open-back over-ear planar-magnetic Audeze LCD-X Music Creator bundle (without the fancy Audeze travel case) go for $1200 in new condition but if you want to save some, you can get them in “Used – Very Good” condition for $999 with free shipping by seller “Audio Advice Online” (AAO) through Amazon Warehouse Deals. They ship directly from AAO and they are not Prime eligible. Audeze had been teasing this and the tease has now solidified. The Mobius is a planar-magnetic cinematic immersion 3D type of a headphone and for a limited time, you can be among the first to pre-order it at IndieGoGo for $250 as an early bird special price. The official price will be $400 when it launches. Note that delivery is Massdrop-like, June 2018. It ships worldwide. They have a total of 1000 available, with 656 available at the $250 tier. There are many more available in the $299+ tiers. Some high profile retailers have run out, but if you are currently looking for the AUDEZE LCD-X Music Creator edition in new condition from authorized Audeze USA dealers, it is currently in-stock and ready to ship at Adorama directly with free expedited shipping and by Adorama and World Wide Stereo through Amazon (Prime eligible) for $1199 with free shipping and handling. The new condition Audeze SINE DX On-ear (open-back planar-magnetics) go for $599 but if you want to save some by going used, they are available in “Used – Like New” condition (damaged original packaging) for $509~ with free shipping by Amazon Warehouse Deals actual. This description typically suggests just damaged packaging, but obviously I have no way of knowing for sure for each specific listing. The convergence of technology makes for strange retailer bedfellows. 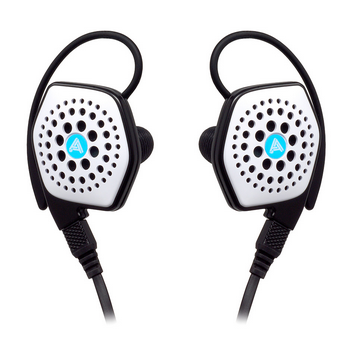 At the moment you can get the new condition iSine VR planar-magnetic earphones for $180 at Think Geek of all places. Only the VR version is available. These are not eligible for site-wide Thinkgeek coupon discounts. The AUDEZE LCD-3 Planar Magnetic Headphones (Zebrano & Lambskin Leather) are currently available in “Used – Demo” condition for $1149 plus shipping (under 420) at authorized dealer Adorama.com. When it sells out, you won’t see any results in the link above. One of the new CES 2018 earphones is already in-stock! The brand new Audeze iSine LX planar-magnetic in-ears is in-stock and shipping from the Audeze Amazon store for $199 with free shipping, with the orders fulfilled by Amazon so Prime members get free 2-day shipping. This brings Audeze closer in price to the Monoprice “homage” that is the M300 which goes for $150 in new condition, or for $100 as open box. Merry Christmas with a budget buster! It’s back on sale again, and $200 less than the previous sale during the Black Friday season, it is the new condition AUDEZE LCD-4 Reference Open Circumaural Headphone is on sale for a limited time for $2799 with free shipping at authorized dealer Adorama with Audeze warranty. Stacksocial carries a limited selection of headphones and for a limited time, coupon code GREEN20 gets you 20% off their current prices. With the coupon factored in, among others, the prices drop for the Audeze iSine 10 planar in-ears to $225 for the standard version and down to $255 for the Lightning cable version. During the Cyber Monday festivities, coupon code CYBER20 (previous it was BFRIDAY20 for Black Friday) will get you 20% off almost everything at Stacksocial.com. They carry some headphones there, their most famous are the new condition Audeze iSine 10 planar magnetics. 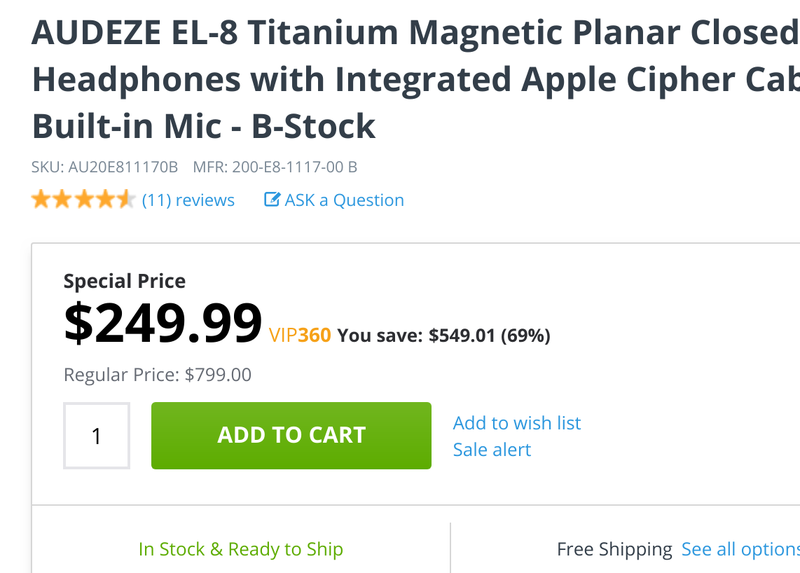 Before the coupon, they are on sale for $279 for the standard and $319 for the Lightning Cable version. They are both on the same listing. After the 20% off coupon, they drop to $223 and $255 respectively. If you are planning to get anything educational or software, coupon code CYBER40 gets you 40% off those during the Cyber Monday 2017 festivities. This sold out… It’s the “one more thing” with Audeze after their planar invasion and then we move to other brands. It is the manufacturer refurbished Deckard Headphone Amplifier offered for $339 by the Audeze Amazon store, with the orders fulfilled by Amazon, so you get Prime shipping if a member. Two more Audeze planar-magnetic over-ear headphones are on a Black Friday sale at Adorama, it is the new condition AUDEZE LCD-X Reference (Aluminum/Lambskin) going for $1050 with free shipping and handling, and also the new condition AUDEZE LCD-3 (Zebrano & Lambskin) going for $1300 with free shipping. The new condition AUDEZE LCD-4 Reference Open Circumaural Headphone is on sale for a limited time for $2999 with free shipping as part of the Black Friday festivities at authorized dealer Adorama with a 3-year Audeze warranty. This is back in-stock again, the manufacturer refurbished Audeze EL-8 Open Planar-magnetic over-ear headphones are offered for $339 with free shipping and a standard 3-year warranty on the driver and 1-year warranty on everything else by the Audeze Amazon store through Amazon Warehouse Deals. This is Prime eligible, so you get it in about two days if you are a Prime member. As of the time of writing, there are nine units available according to the Amazon shopping cart. Planar Mania 2017 continues as more and more models come out, thus putting more price pressure on existing models. Which may explain why the return of the cyclical Audeze LCD-2 sale at Adorama is now at $649. Previous “cyclical sales” were at $699.